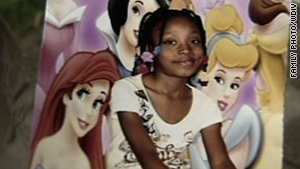 (CNN) -- An attorney representing the family of a 7-year-old girl shot to death Sunday in a police raid is accusing the Detroit Police Department of misrepresenting the incident. In an interview with CNN affiliate WDIV on Monday, Michigan attorney Geoffrey Fieger said he obtained video footage of the incident captured by a crew filming for the A&E network show, "The First 48." Fieger, who didn't say how he received the tape, said it shows officers rushing the home and throwing a flash grenade through a window before one officer fires into the home from the front porch. However, according to Assistant Police Chief Ralph Godbee, preliminary information indicates that members of the Detroit Police Special Response Team approached the house and announced themselves as police. Godbee cited the officers involved and at least one independent witness. Godbee said officers used a "flash bang" device, entered the home and encountered a 46-year-old female inside the front room. "Exactly what happened next is a matter still under investigation, but it appears the officer and the woman had some level of physical contact," Godbee said in a statement Sunday. "At about this time, the officer's weapon discharged one round which, tragically, struck 7-year-old Aiyana Stanley Jones in the neck/head area." Police were executing a search warrant in the search for the suspect in a shooting Friday that killed a high school student. Godbee said the 34-year-old suspect was found and arrested at the home where the girl was shot. In addition, a vehicle and a moped matching the descriptions of those involved in the shooting of 17-year-old Jarean Blake were also found, he said. Fieger called the explanation from police "entirely false." "Of course, I have seen the videotape and the videotape vividly portrays the fact that a percussion grenade device was thrown through the front window and a shot was fired immediately from the outside from the porch," he said. "No murder suspect was found in Aiyana's house," Fieger said in Monday's interview. "In fact, there's an upstairs apartment next door which the police did not have a search warrant for and that is where he surrendered, they went into that house too. But he was not in Aiyana's house." Aiyana's father, Charles Jones, also has denied that the suspect was in his home. Detroit police spokesman Phillip Cook told reporters Monday that he was not aware of the video and declined to comment. The investigation, he said, has been taken over by state police to preserve the "community's trust." A source at A&E, who asked not to be identified citing company policy, confirmed that a crew was on the scene and that the footage was confiscated by police. He would not comment on what the crew had captured on video. Another police spokesman said the department would not identify the suspect in Blake's shooting death until he has been formally charged by prosecutors. The suspect remains in custody. Godbee, in his statement Sunday, said he wished to "express to the family of Aiyana Jones the profound sorrow that we feel within the Detroit Police Department and throughout this community. We know that no words can do anything to take away the pain you are feeling at this time." Police obtained the "high-risk search warrant" based on intelligence, and it was approved by the prosecutor and a magistrate, Godbee said. "Because of the ruthless and violent nature of the suspect in this case, it was determined that it would be in the best interest of public safety to execute the search warrant as soon as possible and detain the suspect ... while we sought a murder warrant."